Special tickets to Lollapalooza are already sold out. However, general admission tickets to Grant Park for Sunday, Aug 6, 2017 went on sale this morning (Wednesday, March 22) at 10 a.m. Concert goers can catch performances on 8 stages from 11 a.m. to 10 p.m. Among Sunday’s features are Arcade Fire, Justice and Zeds Dead. For the full concert lineup see Lineup. For Sunday tickets go to Lollapalooza tickets. Mesa isn’t the only place to find Cubs logos and icons. 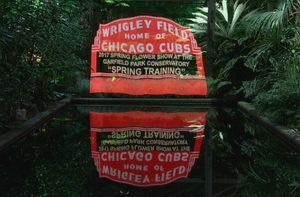 The Chicago Park District’ has turned its historic Garfield Park Conservatory’s Show House into a celebration of baseball and the World Series Champions for its annual Spring Flower Show. This year the theme is Spring Training. 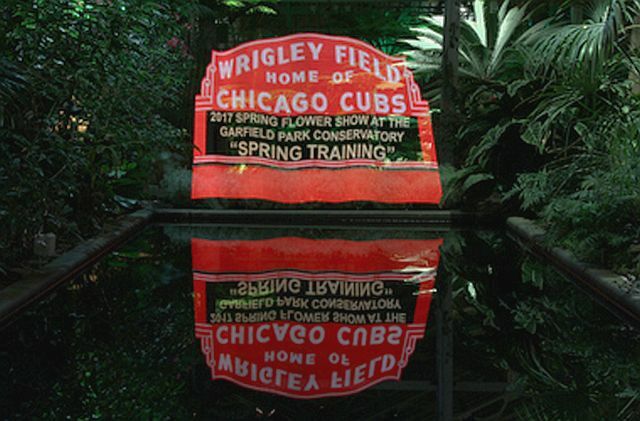 Visitors will see Wrigley Field’s marquee, bleachers, ivy-covered wall and a huge World Series trophy. The “Spring Training” show even includes an icon scavenger hunt. Opened February 18, the show continues through May 14, 2017. Garfield Park Conservatory is at 300 N. Central. For more information visit Garfield Park Conservatory or call (312) 746-5100. You can find inspiration for your garden whether it’s a handkerchief-sized patch, a walkway or a personal hide-away at Chicago’s annual Flower and Garden Show at Navy Pier, March 18-26, 2017. The theme is Chicago Neighborhoods. There are 20 gardens to walk around including some with water features and others with sculptures. In addition the show has seminars, a market section, workshops and family activities. The show is upstairs in festival Hall A and B. Tickets are $5 children, $15 weekdays and $17 weekends. Navy Pier is at 600 E. Grand Ave. For more information visit Flower Show. Watch the magic that turns sap tapped from a maple tree into maple syrup at the North Park village Nature center March 25, 2017 from 10 a.m. to 3 p.m. North Park Village Nature Center. A free event, the festival also includes crafts, storytelling and music. North Park Village Nature center is at 5801 N. Pulaski Rd. For more information visit NPV or call (312) 744-5472. You know that with seasonal change you are supposed to “spring” ahead sometime really early Sunday morning, March 12, right? Well yes, it does depend on where you live because not all places in the United States go from standard to daylight time. Your friends and relatives in Hawaii and in many Arizona locations probably remind you they just don’t do daylight time. However, the US official time when clocks skip an hour is 2 a.m. whatever local time you’re at. According to a US Navy site, Congress designated that beginning in 2007 daylight time started on the second Sunday of March and ended the first Sunday of November when clocks would “fall back” to standard time. Mark your calendar Nov. 5 for your extra hour of sleep if you think the date applies. You can click policy act for more information. Here are five suggestions to help get through the tough change. 1. Change different clocks at different times. Change the clock by your bed before you go to sleep. So if it’s 10 p.m. move it to 11 and tell yourself you are becoming a night owl. Change the kitchen clock in the morning and think how nice it is have slept in so that what was 8 a.m. is now 9 am. 2. Don’t set the alarm for Sunday morning. See what time you can sleep to if given the chance (Unless you are in the church choir but maybe others will also be late). 3. Now, go around the house to check all the other clocks you don’t always look at such as the one on the oven, microwave and coffee pot. Even in this era of automatic computer time adjustments those don’t usually change by themselves. If you would rather not have to do this again in the fall, get a new appliance that does change automatically. 4. 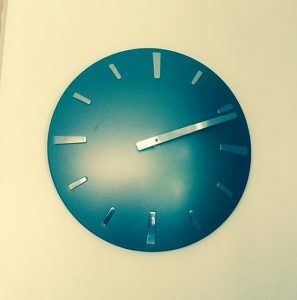 If you have one of those bird clocks that sounds lovely when it tweets on the hour but which you hate when you have to take out the batteries and go back to a specific time, put batteries back in and reset, then ask a friend to come over. Tell the person you want to share the joy of learning the different bird sounds and show your friend how to turn the tiny wheel in back until the right time appears. 5. Call a friend to see if that person is up. Say it’s a friendly wake-up call but actually misery likes company. “Faith and Begorrah,” it seems everyone is already in an Irish mood. Restaurants, grocery stores and neighborhoods are taking the phrase “Go Green” seriously now through St. Patrick’s Day March 17. 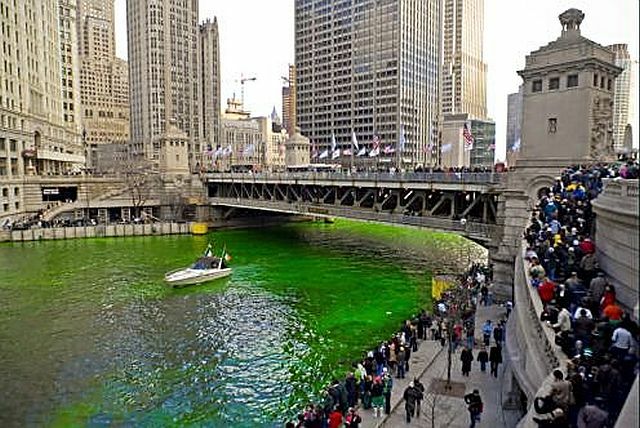 Here are just a few of the places in and around Chicago where you might hear céad míle fáilte (a hundred thousand welcomes) and Irish music, see Irish dancers and feel you ought to be wearing something green. Walk into any Hackney’s, a 76-year-old family run restaurant and pub this week to see how leprechauns expressed the family’s Irish roots and pride. The menu has lots of choices including the famed Hackney Burger but during the weeks leading up to St. Pat’s Day you might want to go for the corned beef, straight up or in a Reuben. For Irish music with your grocery shopping check out the Sunset Foods stores in the northern suburbs. Irish dancers will be at Sunset’s five store on March 5. They will be in Libertyville at 10:30 a.m., Lake Forest at 11:45 a.m., Highland Park at 1 p.m., Northbrook at 2 p.m. and Long Grove at 3 p.m. The city has several St. Patrick’s Day parades but your first stops should be on Saturday, March 11, 2017. 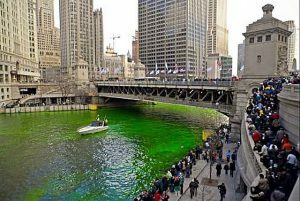 The Chicago River at Michigan Avenue and Wacker Driver will be turned green when vegetable dye is poured in at 9 a.m. The city’s St. Patrick’s Day Parade has bagpipers, bands, dancers and dignitaries step off at noon from Grant Park at Columbus Drive between Balbo and Monroe Drives. Lots of folks go over to the Irish American Heritage Center at 4626 N. Knox Ave. after the parade for an all afternoon-evening party. Tickets: $12-$15 adults; free for children 12 & under. The festival continues on Sunday. Time is noon from Western Avenue between 103rd St. & 115th St.
Time is noon from Onahan School at 6634 W. Raven St.